Heat oven to 325°F. Grease 9-inch glass pie plate. In medium bowl, mix apples, cinnamon and nutmeg; place in pie plate. In medium bowl, stir remaining filling ingredients until well blended. Pour over apple mixture in pie plate. In small bowl, mix all streusel ingredients until crumbly; sprinkle over filling. Bake 40 to 45 minutes or until knife inserted in center comes out clean. Cool 5 minutes. Store in refrigerator. Some of our favorite varieties of apples for baked pies and desserts are Empire, Regent and Spartan. For more fiber and color, don't peel the apples before slicing them. To ensure recipe success if using a vegetable oil spread, use a spread with at least 65% vegetable oil. To make luscious Impossibly Easy French Pear Pie, substitute 3 cups sliced peeled pears for the apples. 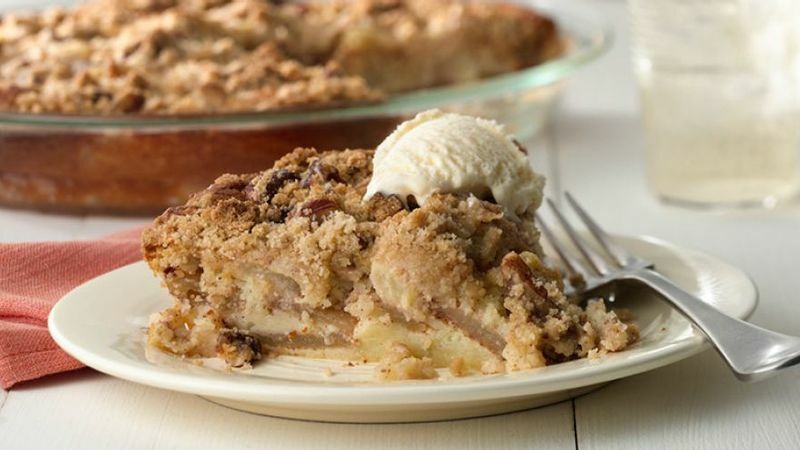 This is the recipe you need when you want to enjoy apple pie but don’t want to fuss with a crust. In three easy steps, you can serve up a delicious dessert using fresh apples and some pantry staples. What makes this french apple pie really special is the sweet topping. Made from nuts, brown sugar, Bisquick and butter or margarine, the crumbly streusel browns up beautifully in the oven giving an impressive look to a pie made with the simplest ingredients—no one will ever guess this is made with Bisquick! So don’t stress about pulling off this recipe, and first time bakers should remember, Betty’s got all the tips you need to bake a perfect apple pie your very first time.